I have made many friends through food blogs and social networking sites. I chat, exchange notes and share my personal thoughts with them and yet I haven’t met any one of them in real world! If given a chance I would like to meet few of them face to face. 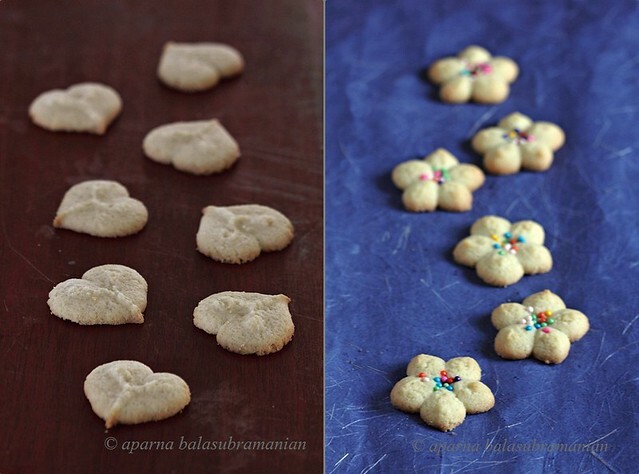 Aparna of gorgeous food blog My Diverse Kitchen is one such person whom I would LOVE to meet! Her lens captures the vibrant life and makes the world and, of course, foods look so colourful, lively and beautiful! As the name suggests, Aparna’s blog captures the essence of diverse cooking with simple yet exotic recipes, beautiful narration and crisp food photography that always manages to bring the feeling of warmth! Please welcome Aparna on Monsoon Spice kitchen and follow her on Twitter, Flickr and Facebook. 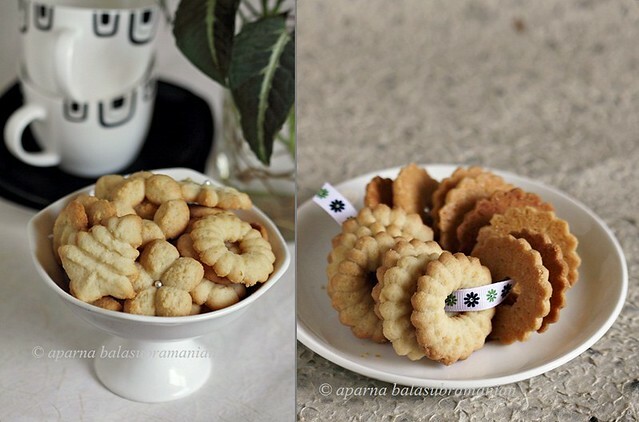 She has perfect recipe for this Chrismas, Buttery Vanilla Pressed Cookies. Wishing all the readers of Monsoon Spice a Merry Christmas and a best wishes for a happy and prosperous New Year! What are friends for, if not to be there when you need them? So when Sia of Monsoon Spice asked if I would do a guest post for her blog, I couldn’t say no. Not that I wanted to say no. Pitching in when needed can be real fun when it involves baking with one’s daughter and that too, something as easy on the hand, eyes and tongue as Buttery Vanilla Flavoured Pressed Cookies! 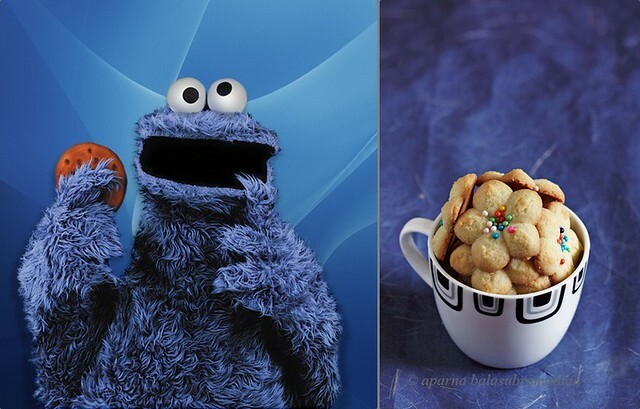 If you have watched Sesame Street, you must know the Cookie Monster. Who can forget that blue, furry monster who cannot think beyond “Me want cookies!”, and his rather uninhibited approach to dealing with them. While I’m happy I don’t have a Cookie Monster at home (his table/ dining manners leave a lot to be desired), I do have a daughter who is a cookie lover and is always happy to know that I’m baking cookies. When she was about four years old, Akshaya designated herself my sous chef. Her favourite thing to do was roll out the most interestingly shaped chappathis (flat breads) for our lunch or dinner. Her next best thing to do was to poke her finger into small balls of cookie dough to make thumbprint cookies and she was ever ready to “help” me whenever she could, in the kitchen and outside of it. Those were the days before I had acquired an electric beater and if I was baking a cake, then she would insist on creaming the butter and sugar with a wooden spoon. Her reward for this was to lick the bowl clean! The onset of the teenage years changed a lot of this and meant she put in less time in the kitchen except to announce that she was hungry, help out with some chores and bake the occasional cookie. Living in India often means that a lot of baking ingredients and bake ware one would take for granted in many other countries, aren’t available very easily. Even if they can be found, they are sometimes so expensive that I find it difficult to justify spending money on them. So whenever my sister comes down to India for her holidays, I tend to shop for a lot of such stuff and have her bring them down for me. My reaction to seeing her unpack once she’s here is probably how Aladdin felt when he came upon stolen treasure in the cave! About a year back, one of the things I got was this cookie press. Akshaya and I had been making a list of things we wanted to get and we came across this cookie press. Memories of very pretty, buttery, slightly crisp but melt-in-the-mouth cookies nestled in individual paper cups ensured that the cookie press made it to the shopping list! When the cookie press eventually got here, we tried it out and were quite thrilled with the pretty cookies we had made. My cookie press comes with 14 different plates so we had a lot of fun piping out different shapes. Unfortunately, the next time we tried making pressed cookies, the whole thing was a disaster and the experience sort of put me off making any more. So last Sunday, with a cookie recipe written out and the ingredients in place she set out to make a batch of vanilla flavoured pressed cookies. A phone call from a classmate, about 2 hours later, had Akshaya telling her, “Have to go now; I’m in the middle of baking some cookies”. That statement ensured that she had a to bake another batch and a half that evening, as she now had a class of friends at school, looking forward to taste testing her cookies the next morning! My husband and I “heleped” Akshaya and had fun pressing out a few cookies (she called it letting out the child in us! ), though we drew the line at licking the bowl clean of the cookie dough!! The general advice everywhere is that when you use a cookie press, it is best to use the recipe suggested by the cookie press manufacturer as this would be of the right consistency to push through the press. This is probably true, but I’m sure any pressed cookie dough that is not too tough or very soft should work. It is a different matter that most of the pressed cookie dough recipes I saw were variations of the one that came with my cookie press. The original recipe uses 1 cup/ 2 sticks of butter which is about 230gm. Since I find butter messy to measure in cups and I get butter here in 100gm slabs, there is 200gm butter in these cookies. I really didn’t see any difference from using 30gm less, as these cookies were still buttery enough. This recipe does not require refrigeration of the dough before piping. Pressed cookies are also called Spritz cookies, from the German word “spritzen” which means “to squirt” probably describing the process of “squirting” out the dough from the cookie press. 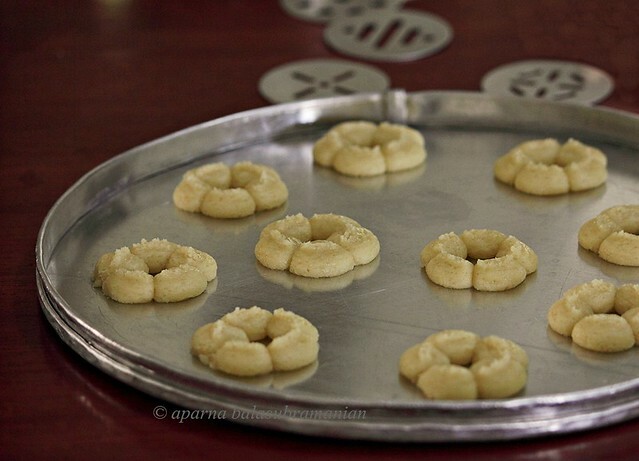 In Scandinavia and Germany, these cookies are Christmas time favourites. They can be made festive by dipping them in or drizzling with melted chocolate, decorating with dried fruit, nuts, jam, sprinkles, silver or gold dragées, royal icing, coloured sugars and many of the shapes make very pretty decorations which can be hung on wreaths and trees. Shelf Life: 5-7 days when stored in airtight containers. Mine lasted for 5 days! Buttery Vanilla Pressed Cookies - Ready to bake! Cream the butter and the sugar in a large bowl and beat, using an electric mixer, till pale and fluffy. Add the egg, milk and vanilla and almond extracts and beat on slow speed till well mixed. Sieve the flour, salt and baking powder and fold into the creamed mixture, in two batches till well incorporated. The dough should be soft and pliable, not crumbly. Fill the dough into the cookie press cylinder, preferably from the bottom, and close after placing the plate of choice in it. Press out the dough onto ungreased cookie sheets and decorate with sprinkles/ dragées/ coloured sugar if you would like to. If you don’t have a cookie press, fill the dough into a piping bag and pipe using a star-shaped pastry nozzle. You might need to bake your cookies a little longer though. Bake the cookies at 180C (350F) and bake for about 10 to 12 minutes until the edges of the cookies begin to brown at the edges. Take the cookies out and let them cool on the trays for about 10 minutes before carefully removing them using a thin metal spatula. If the cookies are removed too soon they will break. Cool them completely on racks. Store them in airtight containers. These cookies are a bit delicate so store them in neat layers separated by parchment. This recipe makes about 36 cookies. Do not grease your cookie sheets, or the pressed cookies will not come off the press and stick to the tray. This also means you need to ensure your cookie trays are completely free of grease. An easy way to fill the dough into the cookie press is to form a portion of the dough into a log slightly smaller than the cookie press cylinder and load it into the cookie press. Loading the dough from the bottom helps avoid air pockets in the dough. Smoothen the edge with a spatula, and then screw on the lower part of the press with the plate. To press out the cookies, hold the press upright, place on the cookie tray and apply even pressure on the handle to press out the shaped cookies. Lift the press straight up once the shape is formed. If your cookie dough is too stiff, thin it with a couple of tbsps of milk. The cookie dough should be room temperature. Bake a test batch, about 2 or 3 cookies, to test the consistency of the dough. The cookies should be crisp through, but not burnt, with clear impressions. Also check the time required to bake them so they just start turning brown at the edges. If the cookie does not hold its pattern, refrigerate the dough for 10 to 15 minutes before pressing. If the dough becomes too hard, let it sit at room temperature or you could damage your press trying to push out hard dough. Some bakers advise not refrigerating the dough at all but adding a couple of tbsps of flour to a soft dough to adjust consistency. So pretty and tempting! I love the way pressed cookies look. Hi Sia & Aparna! gorgeous guest post, photos and cookie recipe. Your daughter Aparna has a beautyfull name. First time I heard this name. I agree baking material is damn expensive or impossible to be bought here. India taought me to value simple things. The cookies look so delicious,am so going cooking press shopping today. Wow very beautiful post Aparna..Sia I am so glad you asked Aparana to do this..I love that cookie press..wish I got it available locally! 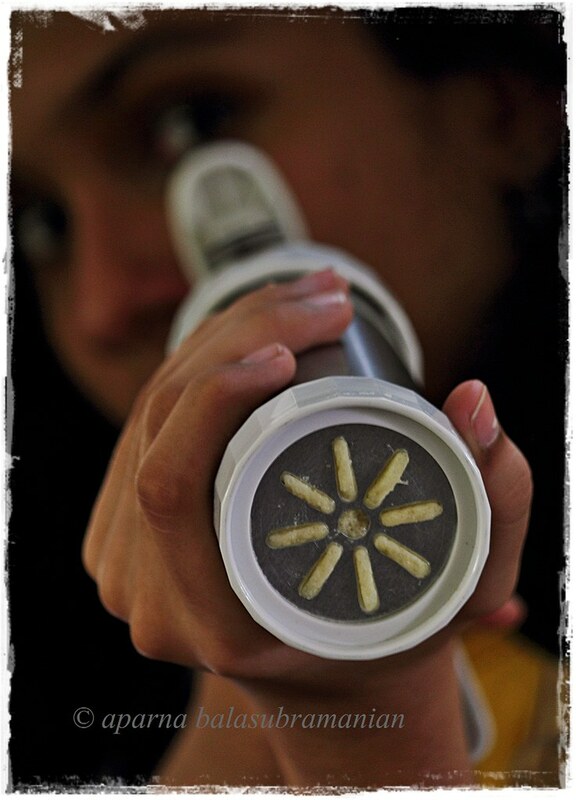 The cookie press is cool..love the clicks.. Aparna's captures are always exceptional..
Nice baking recipe you have here. I will take note of this for my baking hobby :) thanks a lot!! !